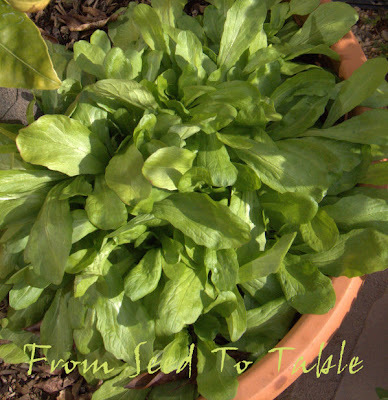 Perhaps you read my post back in February about Golden Corn Salad, a lovely and tasty salad green. That's one plant above that has plenty of room, decent soil and some fertilizer, you can see how large it gets in those conditions. 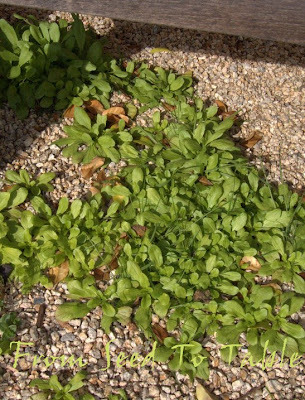 Below is a photo of volunteers growing in the gravel patio under a bench without benefit of fertilzer and only watered by the rain. Those volunteers were not the least bit bitter. 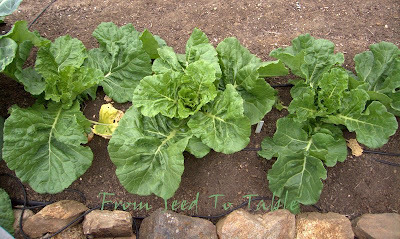 Obviously, this tender leaved plant can take a range of conditions. They'll be back under the bench next year since I allowed a number of them to go to seed. The more lush plant succumbed to an aphid infestation before flowering. 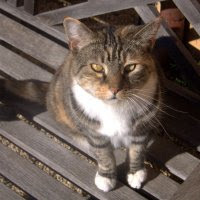 I just cleaned a bunch of seeds from the volunteers and another sowing in the vegetable garden. 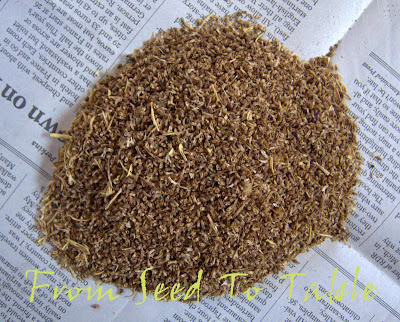 That nice little pile of seeds shown below is far more than what I need for myself. 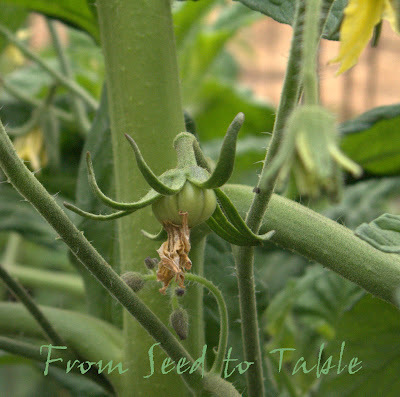 Send me an email (it's on my profile page) if you would like some seeds and we can arrange to get some to you. 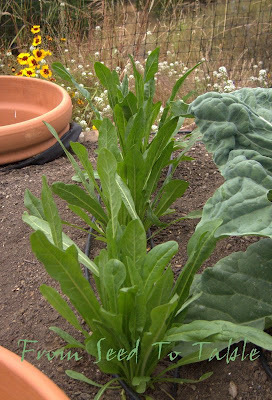 I'm always on the lookout for seeds of rare vegetables such as this corn salad (still looking for seeds of Spanish Black carrot), so let me know if you have something to swap. Here's a great article on Golden Corn Salad by William Woys Weaver. 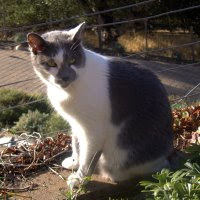 My original seeds came from him through the Seed Savers Exchange (there's a link on the sidebar). Alas, Mr. Weaver no longer offers seeds through SSE. There they are, six weeks worth of caper pickings. The bottom row, from left to right, weeks 1 thru 3. The top row, from left to right, weeks 4 thru 6 (another 2 1/2 ounces). The small jar in the middle are week 4 extra large long-stemmed capers that I've taken out of the brine and put into a 50% white wine vinegar solution. Those are going into the refrigerator to pickle for a couple of weeks. The rest of week 4 will be packed into salt like batch 3. Batches 1 and 2 were dried and I'm keeping those in jars at room temperature. I've been tasting the capers at all stages of the process. Last week I tried one bud fresh off the plant - yuck! It amazes me that anyone could ever figure out that something so sharp and bitter tasting could be transformed into something delicious. A week of brining entirely transforms the flavor, although they still have a bit of sharpness, after two weeks the sharpness is mostly gone. The dried capers are improving in flavor as they sit and so have the ones that I packed into sea salt. 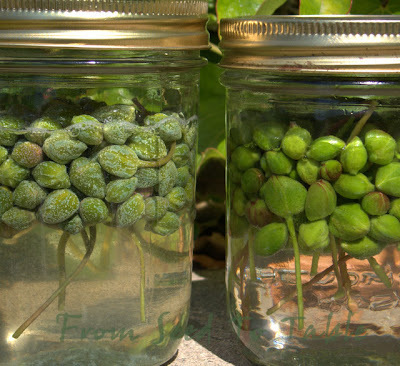 Both the dried and salt packed capers have a floral quality the commercial vinegar packed capers totally lack. The latest batch is going to sit in brine for three weeks. I have been putting the capers into a fresh brine each week. 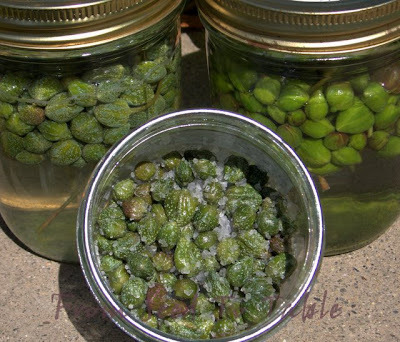 I read that the Italian salt cured capers are made by mixing the fresh dry buds with plain sea salt and the salt pulls moisture out of the capers to create a brine. They use a 30 day process in which the capers are salted and drained 3 times and are then finally packed into fresh salt for storage. The commercial caper processors work with vats of buds, the small amounts of capers that I'm working with don't create their own brine which is why I've been putting them into a brine solution. Last week I used some of the last dried and salted capers from last year in a tomato salad. I soaked the capers in some warm water for a bit to remove some of the salt. Then I tossed them in some extra virgin olive. Those were scattered on top of some sliced heirloom tomatoes (store bought but pretty good) with some crumbled feta cheese, a generous drizzle of extra virgin olive oil, a bit of balsamic vinegar, and chopped fresh basil. The occasional hit of salty caper was great with the tomatoes. 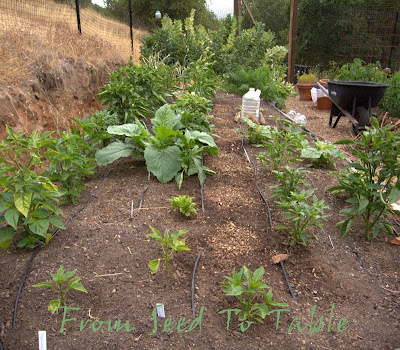 Here's how the vegetable garden looked on the longest day of the year. 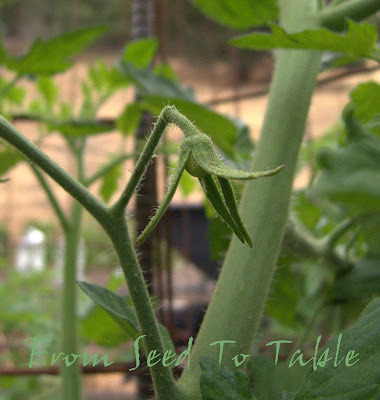 The first tomato has finally set! Above is Black Sea Man and below is the first cherry tomato, Black Cherry. 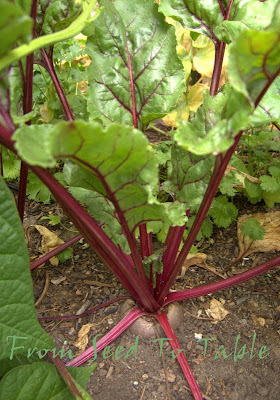 Golden Beet above and Dewing's Early Blood Turnip Beet below. 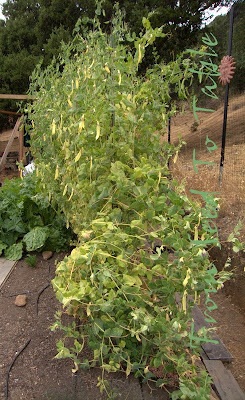 The foliage on the Green Beauty snow peas is yellowing, actually all the peas but Green Beauty is the worst. I think it's primarily because of a powdery mildew infection that was rapidly taking over the plants. I applied Neem oil to the pea plants a few days ago to slow down the infection and that seems to be helping. 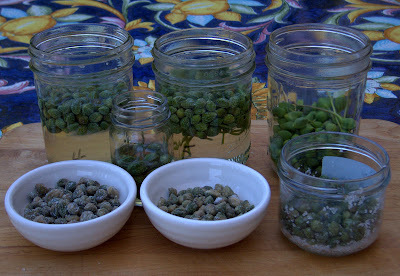 The remaining Green Beauty pods will be allowed to mature and dry so I can save the seeds. 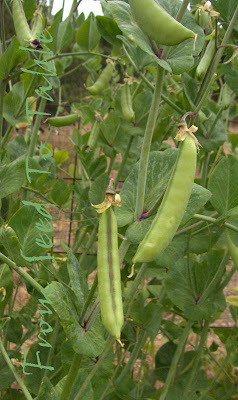 The Magnolia Blossom snap peas have been producing about a pound of pods every 3 days. I've been pickling the pods that we're not eating fresh. The first batch of pickles was ready yesterday and we ate half the jar. 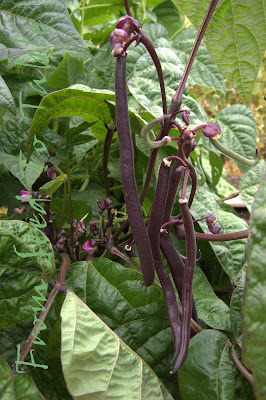 There's a closeup below of the purple stripe that many of the pods have. Peppers and eggplant. 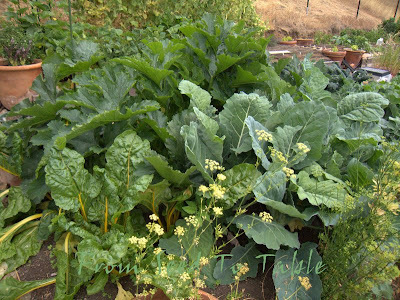 A volunteer rapini plant is growing like crazy and will be harvested whole soon. The pods that I kept on the Crimson Flowered favas (in the back) are starting to dry on the plants which means I will be able to pull the plants soon. The space between the peppers and the favas is reserved for Edamame which I sowed into paper pots yesterday. I sowed seeds of Rat-tail radish in a row between the peppers and eggplant. Rat-tail radishes are grown not for the roots, but for the seed pods which are delicious pickled. Cocozelle zucchini, Golden Chard and Gigante kohlrabi. 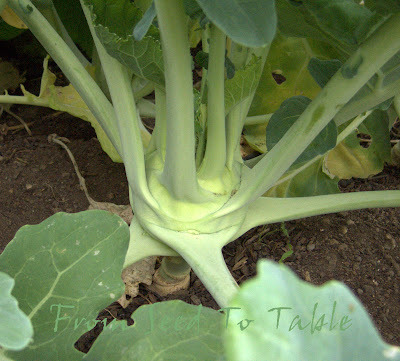 The kohlrabi are forming "bulbs" shown below. 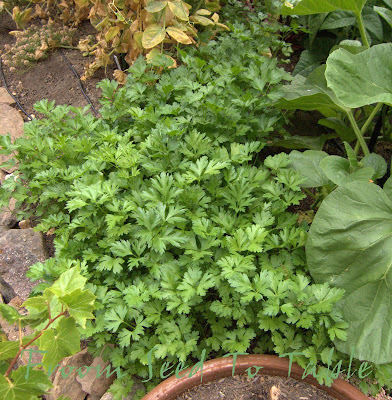 Some parsley in the foreground is blooming for the beneficial insects. Experimenting with Puntarelle, a radicchio cousin. 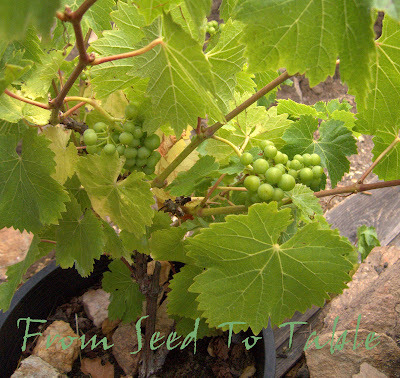 An unknown variety of Czech grapes. 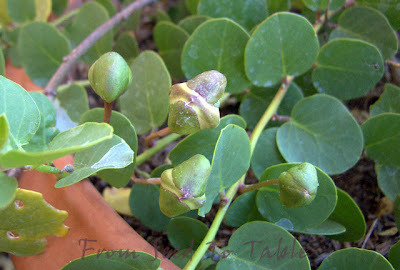 I had completely forgotten that the caper plant that I'm allowing to bloom for seed saving purposes has pink blossoms! 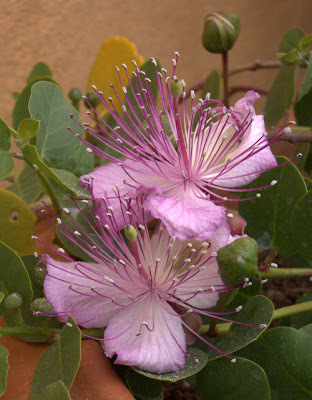 The typical caper blossom has white petals and pinkish purple stamens. There's pollen scattered on the leaves below from my efforts at helping pollination with a fine new little artists paintbrush. I'm not allowing any other capers in the garden to bloom right now so I'm not worried about cross pollination. If these set I'll try growing some out to see if the color gets passed on. 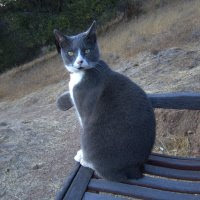 Wednesday has become caper day around here. This morning I harvested the little pile of buds shown above. If I wanted to harvest more uniform sized buds I would probably have to pick about every 3 to 4 days, but I'm not concerned about uniformity so once a week has been enough. After removing the stems from most of the buds I ended up with 1 3/4 ounces of buds without stems and 3/4 ounce with stems. So, the total harvest is about 1/2 pound in 5 weeks. The jar on the left holds last week's harvest (week 4) and on the right is today's (week 5). The jar in front is the capers from the week before last (week 3). Those spent a week in a brine solution and then were drained and packed in coarse sea salt. I've continued to keep them at 55F along with the jars of capers in brine. I tasted one of the salt packed capers today, yummy but needs to sit a bit longer to mellow. The capers from week 2 are still drying indoors on a tray, I tasted one today and it was pretty good. The caper I tasted today from week 1 was fantastic, ready for showtime. If you click on the photo you can probably see how the buds that were reddish colored when fresh have developed bright pink spots. 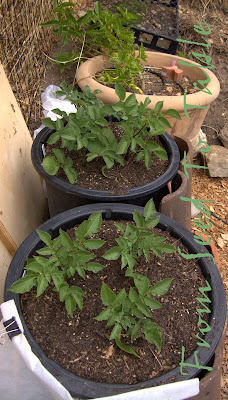 I've chosen one of my Tuscan plants in a pot for seed saving. It's been growing very nicely and is producing a fair amount of buds. The buds shown above should open in a few days and hopefully they will pollinate and produce berries. I'll probably help them along with a fine little paint brush. 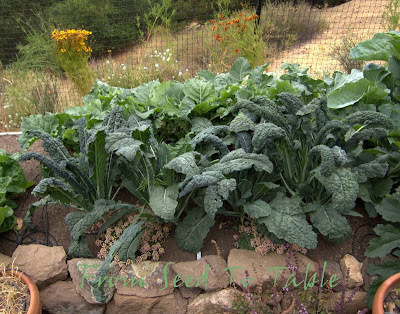 The gardener may have been getting some rest and relaxation this weekend, but the vegetable garden was not. I harvested a generous amount this morning. In the basket, starting with the Royal Burgundy snap beans and moving clockwise: Magnolia Blossom snap peas, Golden Sweet snow peas, Landreth Stringless snap beans, and Green Beauty snow peas. The beans are the first of the season. 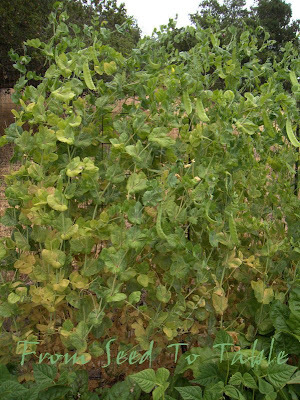 The snow peas are slowing down and may be done soon since the plants are starting to get powdery mildew. 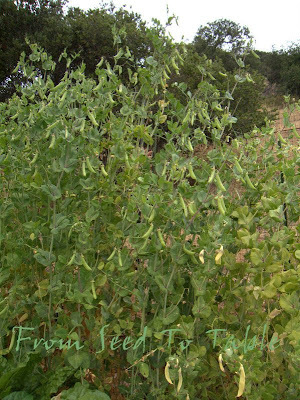 The snap peas are about halfway done. To the left of the basket are a couple of the remaining Atomic Red carrots and some Amarillo Yellow and Lunar White carrots. The red carrots had a tendency to bolt but the ones that didn't have been sizing up nicely over the past two or three months. The Amarillo Yellow and Lunar white carrots were slower to size up but all of a sudden they are getting big, especially the yellow ones. 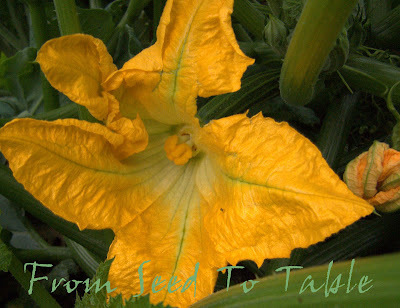 On Friday morning I picked the one zucchini that had formed. Look what happened over the weekend, eight zucchini in three days! And then there's a mound of Senposai whose leaves seem to be having a competition with the zucchini to see who one can grow faster. Well, no, not quite, I should have started picking the Senposai a week ago but I've not been eating at home enough lately to make use of it so it stayed on the plant. 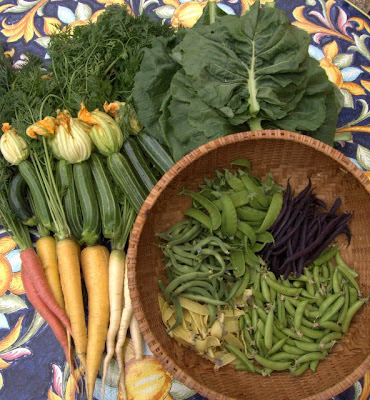 Friday morning's harvest also included a big bag of snow peas and a pound of snap peas. One pound of snap peas is just a tad more than what it takes to fill a quart canning jar so they were made into the second batch of pickles. I think I'll blanch and freeze the snow peas that I picked today since I still have the bagful that I picked on Friday. 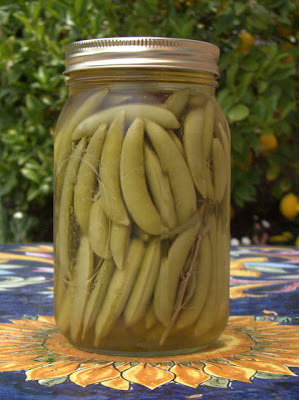 Here's my easy recipe for pickled snap peas. Wash and string the snap peas. Pack them into a clean 1 quart canning jar with the tarragon, garlic, and dried chiles. Combine the vinegar, water, sugar, and salt in a saucepan and bring to a boil. Remove from the heat and allow to cool completely. Pour the cooled vinegar mixture into the packed jar to completely cover the peas, cap and store in the refrigerator for at least 2 weeks before eating. Store the pickles in the refrigerator. I used a Spanish Moscatel vinegar that is wonderfully fruity. I highly recommend it if you can find it, otherwise use the tastiest vinegar you can find. A fruity apple cider vinegar would be a good alternative. Just be sure that the vinegar you use is at least 4% acidity since these pickles are not processed and it's the acidity that kills any harmful organisms that might be present. 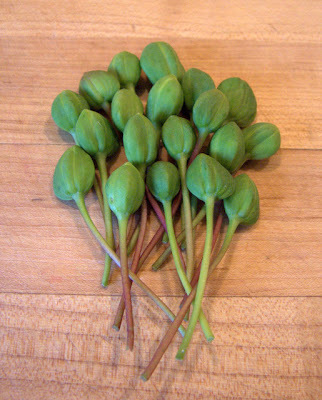 Some of the caper buds that I picked this morning were extra large, about 1 1/2 inches long with the stems. I thought it might be nice to ultimately serve them with the stems attached so I left them whole. I may put those into a good fruity vinegar instead of drying them. 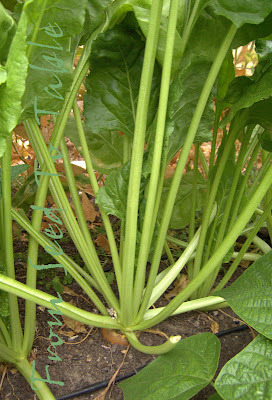 The "long-stemmed" bunch shown above weighs 1/2 ounce. The rest of the capers came in at 2 ounces without stems. 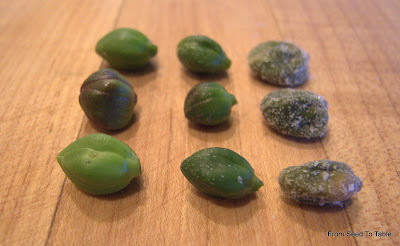 So the last four weeks have yielded 6 ounces of fresh caper buds. I tasted another dried caper from batch #1 and was very pleased to find that the flavor is even better than last week. Batch #2 has developed some nice rutin speckles after 2 weeks in the refrigerator, so I'm putting them out to dry today. Batch #3, which is fermenting at a warmer temperature, is nicely speckled also. I don't have another tray for drying that batch, so I'm going to drain them and pack them in fresh coarse sea salt, and see what happens. 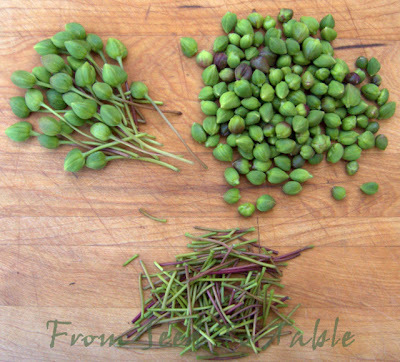 The capers on the left were picked this morning. In the center row are the capers I picked a week ago. Those have been sitting in a brine solution in the refrigerator. The capers on the right are the ones picked two weeks ago. Those were dried in their brine solution, which took a day and a half (one day was foggy half the time) and then a day sitting on the kitchen counter. The first batch are stored in the salt from the brine solution that crystalized during the drying process. I may store the next batch in fresh coarse sea salt. 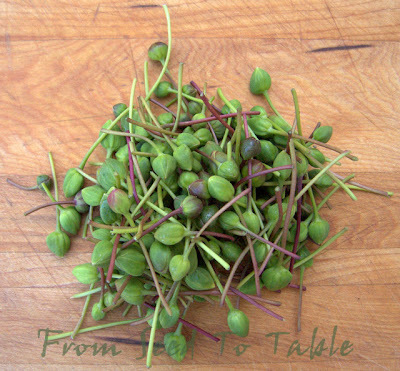 The Tuscan plants tend to have a reddish color to their leaves and buds which you can see in the fresh and brined capers in the second row back. The pickling process, I think it is actually a kind of fermentation, is slower at cold temperatures. The first batch developed more rutin crystals in a week of brining which is probably because it had a day at room temperature. I'm going to keep batch #2 in the refrigerator another week. Batch #3 is going to sit in a brine solution at 55F for it's first week. The dried buds were a bit sharp tasting immediately after drying, but seem to have mellowed a bit after sitting in a sealed jar at room temperature for a week. 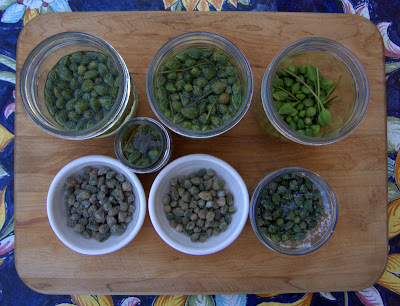 So far it has taken three weeks to pick about 3 1/2 ounces of fresh capers. Finally, after what seems like ages. Coming in at eight pounds, nine ounces. 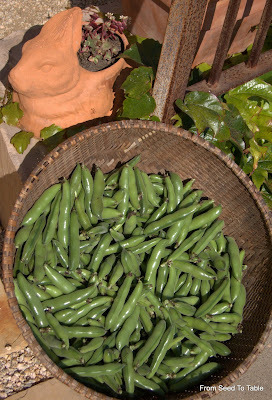 A basket of beans from the Crimson Flowering Favas! There are actually more that I could have harvested but I left three or four of the oldest and best beans on the plants to save for seeds. There was one brief period when the plants set pods and now that most of them have filled out I've picked them. 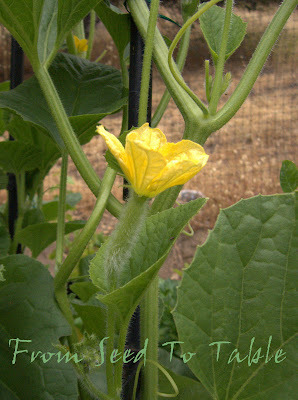 There are a few developing pods left and even a few stalks that still have flowers. But I think that this is basically the crop. Tonight some of them are going into a Moroccan fava puree/spread that my husband has been asking me to make for weeks. It's flavored with cumin and lemon juice, and contains a generous amount of olive oil. I'm going to serve that on little toasts with sheep's milk feta and some arugula. Here's a recipe for the spread. It's very difficult to estimate how many pounds of pods are required since different varieties have different sized pods and the beans within vary in size depending on how mature they are. Blanch the beans for 2 to 3 minutes. Drain and reserve a few tablespoons of the cooking liquid. Puree the beans with the olive oil, lemon juice and cumin in a food processor or blender until smooth, adding some of the cooking liquid to bring it a consistency that you like. Season to taste with salt. The puree will thicken if refrigerated. 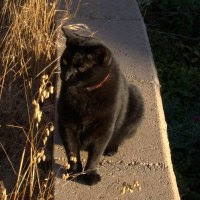 I like to serve it on toasted slices of baguette or rustic bread with some crumbled feta and chopped arugula on top. It's also good with pita bread or fresh vegetables.